Juvo Leads chat provides 24/7 live agent support for your website. Juvo Leads isn’t only live website chat– all packages include call tracking, form tracking, and the lead dashboard that you can login to at anytime to see your lead data. We’re a proud SWAS (Software With A Service) provider. Our platform comes with a lot of features that will help you convert more leads. But first let’s discuss why and how a website benefits from using live website chat, then compare juvo leads live website chat to other chat options. Finally, after we’ve shown you why and how live website chat benefits you, we’ll show you all the features you get with Juvo Leads that you don’t always get with our competitors. When a visitor comes to your website they are either, 1) looking for the answer to a question or, 2) researching to see if they should contact you for services. Live Website Chat helps visitors in both situations, albeit somewhat differently. Let’s first look at Scenario #1: A website visitor hunting for an answer to a question or solution to a problem. Whatever question or problem brought this person to your website in the first place – they’re seeking an answer. Website Chat offers the promise of a quick answer instead of having to read through the page to find what they’re looking for. When this visitor sees the chat agent engage them – they see an opportunity to get their question answered by a real person. For 90% of subject matter questions and for some websites (like law firm websites) we don’t know the answer and even if we did we would never provide an answer. Here, however our job is to LISTEN to the person asking the question and to FILTER out questions that won’t end in leads. For those questions that do have the possibility of turning into a lead, we offer our visitors an answer to their questions in the form of a “Free Consultation,” “Intake Meeting,” or any other initial correspondence to convert the website visitor into a lead. Having a HUMAN offer this free meeting results in more leads for the website. I say HUMAN because in the next section, we’re going to be talking about Live Chat Operators vs. Chat Bots. Scenario #2: A website visitor comes to your site specifically looking for your services – chat helps them achieve their goal (getting a consultation) in the fastest way possible and through a medium (chat) that they’re most comfortable using. Websites with Juvo Leads live website chat convert on average 41% more website visitors into leads than websites without chat. Live Website Chat = Juvo Leads = Chat Software + Chat Agents Service. Website Chat = Software by itself. Most of time when you hear or see ‘Website Chat’ by itself, it means a software service for which you need to provide chat operators. Bot Chat = Automated bot answers based on what keywords the visitor types. Each type of chat above has its pros and cons – and not one in necessarily better than the other (although we like LIVE website chat ourselves) but each chat option has uses in certain cases where it’s better (sometime vastly better) than any other alternative. Live Website Chat tends to be the best option for websites in the service industry (legal, medical, consulting) with medium and large lead values. For instance, if a lead could result in a $2,000-$3,000,000 sale, case, client, or patient, then live website chat is the best option. For leads that are worth less than $2,000 per lead, then bot chat or company-operated chat might be better. How do chats begin? There are countless ways your website can show visitors that a live website agent is ready to chat with them – but what is the best way? The goal of starting a chat needs to be balanced with not appearing overly “pushy” while still being “flashy” enough to convert visors into “chatters.” If a website’s “pop-up” doesn’t engage enough visitors, the website will get less leads – but overly aggresive pop-ups scare visitors away resulting in less chats and leads. All of our chat interfaces start with an introductory message that appears on the bottom right hand side of a desktop site (like the one to your right below) or on the middle bottom of a mobile site. Here at Juvo Leads, we tested each and every type of chat interface with the main goal of converting visitors into chatters and creating an interface that was intuitive for users. Our chat bears a strong resemblance to the most used website chat application in the United States – Facebook chat. After literally hundreds of iterations, we learned that the chat with the design that most visitors were already familiar with had the highest visitors’ interaction rates. Many of our Live Website Chat competitors use full screen pops up that are bad for SEO and scare visitors away. Juvo Leads live website chat is both SEO friendly and non-intrusive, yet is able to convert website visitors into chatters at the highest rate of all the website chat services currently offered. You can read more about how Juvo Leads is SEO friendly HERE. Once a visitor clicks the “Chat Start” (pop-up, “chat with us” link, bottom icon) what happens next? Most live website chat services then open a new window in the visitor’s browser which is both jarring and time consuming. In contrast, all Juvo Leads chats happen in the browser window the visitor is currently in – reducing the time needed to chat and eliminating the additional pop-up. Our chat competitors force open new browser windows and take longer to get to the actual chat – which significantly reduces conversion rates. Juvo Leads chat interface converts at the highest rate from “Visitor Start Chat” to “Agent Reply” because we’ve eliminated both the new window delay and the jarring reaction to seeing a new window unexpectedly load. Eliminating these two small but substantial elements increases our conversion rates by over 24% compared to traditional live website chat services. This message is by no means revolutionary – but we do have one feature that’s unique (at least for now) and dare I say “Revolutionary” in the live website chat space? We call this feature “Three dots of glory” and it increases visitor to chatter rates significantly. “Three dots of glory” came about when were on our 76th A/B test trying to create a chat interface that converted higher than all the rest. A/B test 76 taught us that by adding three rotating dots to mimic a real person manually entering text in a chat application, we would beat all other chat “starters” by 52%. These “three dots of glory” gives a website visitor the impression that our agent is “live typing” the introductory message to them personally and in real time. This is akin to walking into a clothing retailer and having a customer service rep walk up to you and say “If you need any help I’ll be here” as opposed to a flashing neon sign that tells you about the sale. In truth, our Juvo Leads chat agents do not get notified of an actual website visitor UNTIL the visitor starts replying . But the website visitor is under the impression that a human chat agent is typing a message specifically to them. This “personal chat message” significantly increases the visitor to chat ratio. Lastly – this intro message is customizable for each pager for each website. Juvo Leads chats uses custom replies and answers – in other words, no “form responses”. We provide every website with a custom “Cheat Sheet” that we treat as a “living document” and which we add to regularly. Just like how every website defines a lead differently, Juvo Leads provides custom answers to each and every question. Our custom chat scripting process begins with a thorough examination of the existing website. We analyze the website when filling out our “Suggested Answers” form where we carefully draft custom answers to what we predict are the top questions our agents are likely to be asked. With our “Suggested Answers” in hand, we then ask for feedback as well as seek clarification for any remaining questions. Just like how no two websites are the same – no two chats should be the same either. Juvo Leads takes great care to provide the best chat in the world. We are able to achieve that through rigorous agent feedback combined wtih weekly scripting sessions where we review each and every chat with our agents, thus allowing us to improve our chat over time. The Juvo Leads process is what separates us from our competition, but the real “skill” our agents provide is their persuasion techniques. Most websites chats start with a visitor asking a specific subject matter question. And despite not being subject matter experts, this is where our agents excel. Our chat techniques are not revolutionary but they are specifically designed to keep each conversation moving forward and to build rapport, so after we’ve qualified the chatter we can move in for the “Ask” and get the persons’ contact information. The general rule is the more responses we elicit from each chatter, the greater the likelihood that our “Ask” is successful and gathering lead information. Response time matters. Once a new chat lead is saved, notifications are sent out via email and optional SMS (Text) messages to a person or team who contacts new leads. Regardless if you are a one person law firm or corporate sales team with 50+ sales associates you’ll get your lead notifications instantly via whatever medium you prefer. All notifications provide a chat summary, name, and phone number along with a big “Click to call” button for mobile users. The full chat transcript is also provided with every notification. 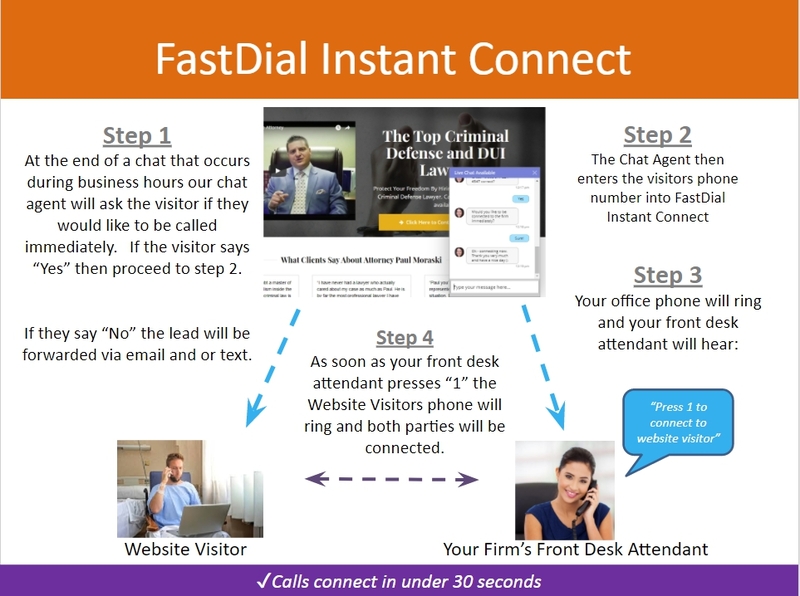 Fastdial – “Instant Chat to Call” is an optional feature whereby chat leads are given the option to be contacted with the business or firm immediately after their information is collecting by our chat agents. Chat Agent: Just to confirm that’s 617-648-9579 correct? Chat Agent: Perfect thank you. Would you like to be called by the firm right away? Website Visitor: Great – I’ll pass this along now. Your phone will ring in about 20 seconds and you’ll be connected with Jim Smith of Example Law Firm. Thank you very much and have a great day. At this point – our chat agent passes along the chat message and Fast Dial auto dials the website. Once the business picks up, they’ll be given an option to “Press 1 to speak with a Website Lead.” Once the person presses 1, the chatter will be called and the conversation will begin. This option is best used during business hours when an intake specialist is ready to answer calls and process new leads. Juvo Leads provides custom support for all CRM integrations. Does your business or law firm run off a carefully set up CRM or Sales Management System? Juvo Leads provides custom integration based on individual cases. Juvo Leads fully integrates with both Google Analytics and Google Adwords. Want to know what pages, keywords, and campaigns are driving the most cheats leads but don’t want to open the Juvo Leads dashboard? Both Analytics and Adwords integration is fast and easy. Some websites provide “Click to Text” buttons on the mobile version of their websites. These buttons allows website visitors to quickly send text messages to the business or firm. Juvo Leads will respond to these incoming text messages just as if it was regular chat. One added bonus of these “Text to Chat” messages is that the chatters, or rather texter’s phone number, is collected without the Juvo Lead agent asking for it. This means text chats can be passed along to an appropriate lead intact specialist as soon as the first message comes in – regardless if the text chatter even responds to the Juvo Leads’ agent. Juvo Leads is built on flat pricing. Which means websites are charged on a per chat basis. We’re proud to be the only live website chat that offers flat pricing. You can find our complete plan information here. Juvo Leads flat pricing allows for both better chat service and less time and energy for business owners receiving bad (unqualified) leads and fighting over refunds. Better Lead Qualifications: Website owners determine what constitutes a qualified lead so that our chat agents can filter out chats that do not qualify. Pay-per-lead chat incentivizes agents to pass along chats that aren’t qualified just to earn more money. Less Refund Requests: Flat pricing means you pay for total chats and not just chat leads. Paying for total chats results in significantly less refund requests since our agents aren’t incentivized to pass along non-qualified leads. Less Expensive: Our flat pricing results in less costs per-lead than traditional pay-per-lead services. Traditional per lead pricing ranges from $20-$35 depending on your usage. Let’s say in a month you get 15 cheats leads. That would cost you anywhere from $300- $525. With Juvo Leads, 15 chat leads could be as low a $149 and never more than $289. Better Chat Experience: Juvo Chat Agents are paid on performance but not total leads. Each chat is reviewed and scored across numerous categories. Agents that are helpful, friendly and conversion orientated are scored the highest and thus paid the most. Pay-per-lead agents are strictly incentivized by how many leads they convert, which results in a chat experience that feels more like a sales meeting.